..."Golf is a good walk spoiled." I plan to find out this fall, as I've signed up for beginning golf! Can you believe it? Here's proof! I've been working out at the college to strengthen my back and abs, so I'll have a stronger swing which I don't even quite know is required. But hey, it can't hurt. The semester is over - yay! - easily my least complicated class life (only four classes, though I'll admit with three of them being accounting it was also one of my most interesting semesters). I pulled through with As thankfully. Next semester - starting in August - marks the end of my school career (again). Milo will join me at Western in the fall though I'd guess we'll not see so much of each other given that I'm a senior, and she's gonna be a freshman (living in the dorms even). The grow up so quickly. Today WCU's College of Business held the spring Scholarships and Awards reception. ...and it went well enough. My first PowerPoint assignment ever - click here to download - is done and I think its not awful. Its basically a 7 slide "four truths and a lie" self-presentation. Today is about relaxing (now that I'm home from work). 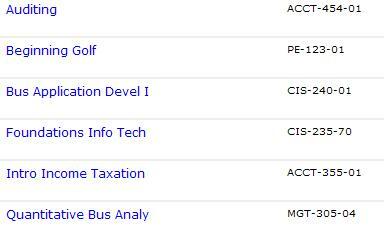 Straight As - Intermediate Accounting, Cost Accounting, Financial Management, Business Statistics and Intro to Marketing. ...and I passed (with flying colors)! The grades should be recorded at headquarters by some time today - and that means on Thursday I'll call the local office and let them know so that I may, with luck, begin training to work there this spring. So I'm taking this tax class at H&R Block basically in the hopes that it will mean my tax class at WCU goes smoothly next fall - but that means I'm also eligible to work as a seasonal Tax Professional for Block this spring. So I have an appointment to speak with someone locally on Thursday. Woot! ...and several firms expect to know if they'll have us move on to the next step by Friday of this coming week. I actually did manage to find the perfect pinstripe suit (pinstripes are evidently the new black based on the data I encountered on Friday) and my pumps were comfortable and everything (though I'd brought sensible shoes to walk the distance from the commuter parking lot to the building). Most surprising to me was the couple of revised thoughts on where I'd most like to be asked to intern - you go in to these things with pretty preconcieved notions I think, and having a couple of those turned on end was interesting to say the least. Everyone was amazingly nice, and very good at putting folks at ease. The interviewees had a "triage" center in the business student lounge where we met between sessions to chat about how our latest round of interviews had gone.